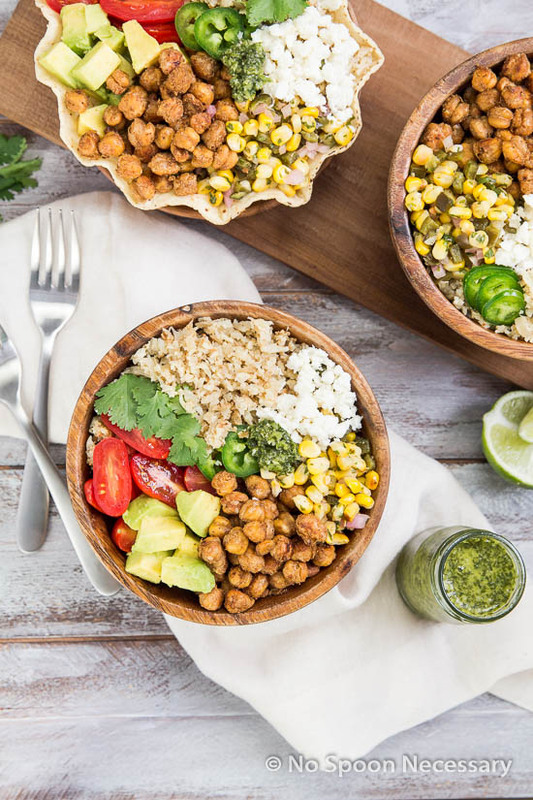 Burrito bowls get a healthy and delicious upgrade with crispy roasted chickpeas and cauliflower “rice”. Trust me, you won’t miss the meat one bit! Anyways, you know what is not depressing, not even in the slightest wee bit? 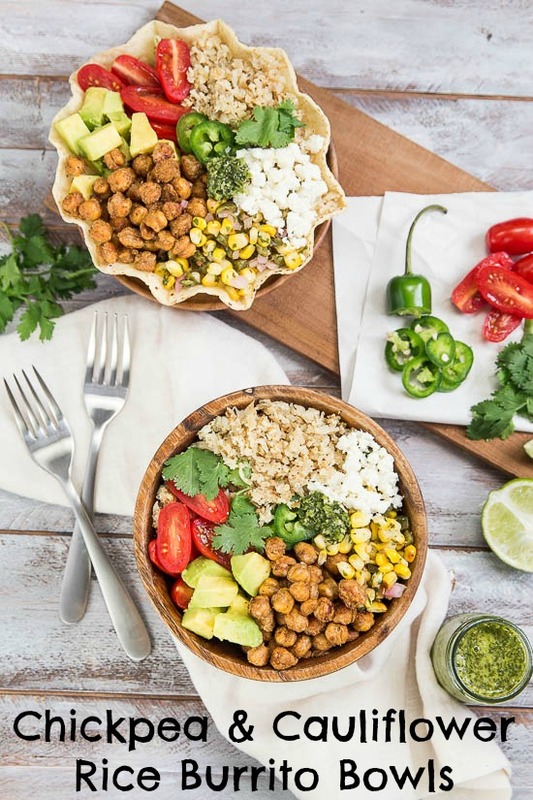 These nutritious and delicious Roasted Chickpea and Cauliflower Rice Burrito Bowls. 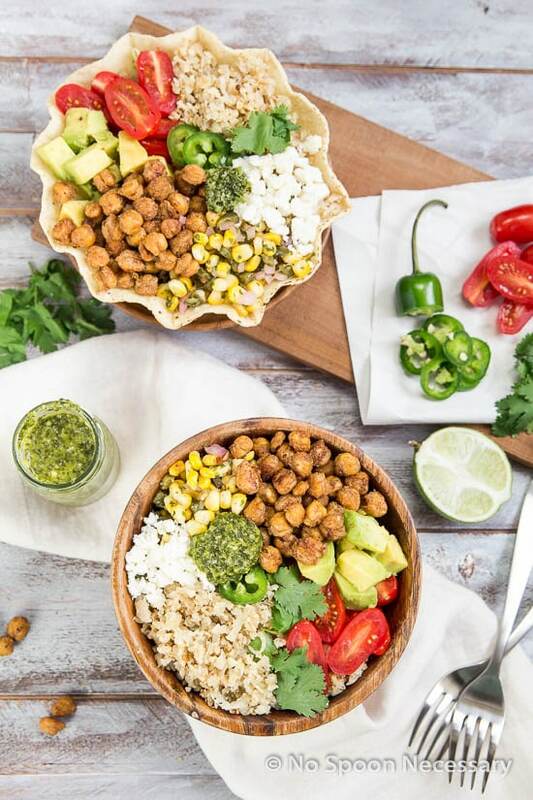 I have developed a serious addiction to these bowls of healthy, vegetarian burrito inspired lovin’. 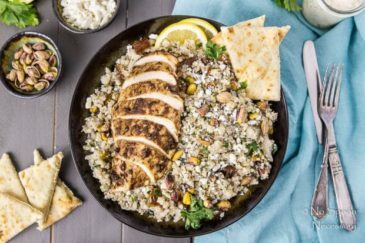 Roasting the cauliflower rice adds depth, warmth and a slight nutty flavor. 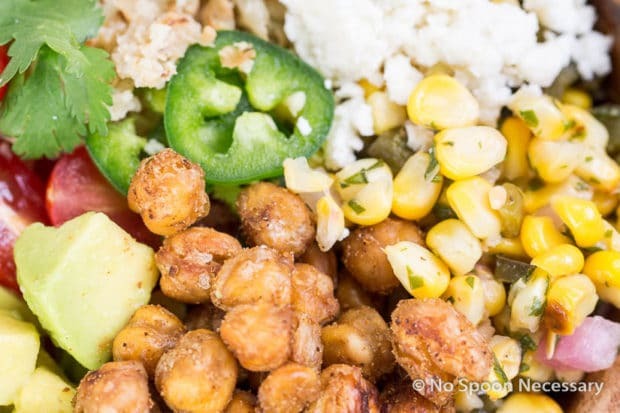 While, roasting and seasoning the chickpeas with taco-esque spices adds crispy, crunchy, slightly spicy, and totally Tex-Mexy appeal. 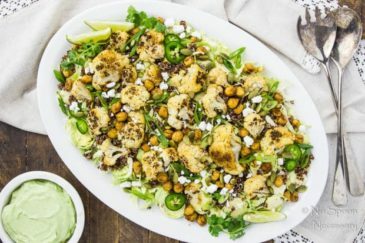 Besides, cauliflower and chickpeas paired together? Match made in heaven! I served my bowls over shredded lettuce and topped them with ingredients I like in my burrito: roasted corn salsa, juicy mini San Marzano tomatoes, creamy diced avocados, crumbles of rich Mexican Fresco cheese and a few slices of jalapenos for a smidge of heat. As if all that isn’t seriously kick arse on its own, I added a cilantro- lime vinaigrette. 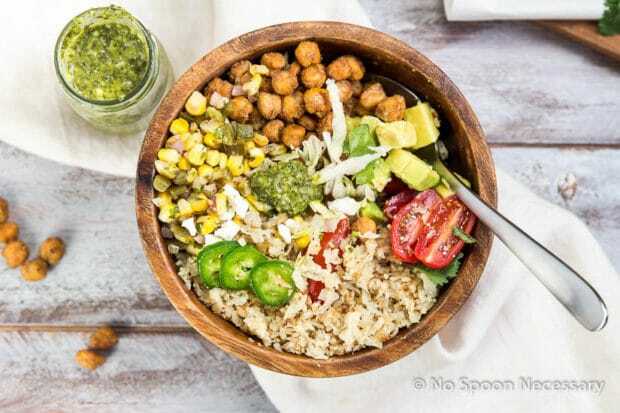 The dressing adds a little earthy, tart zing and really finishes off the burrito bowls perfectly. 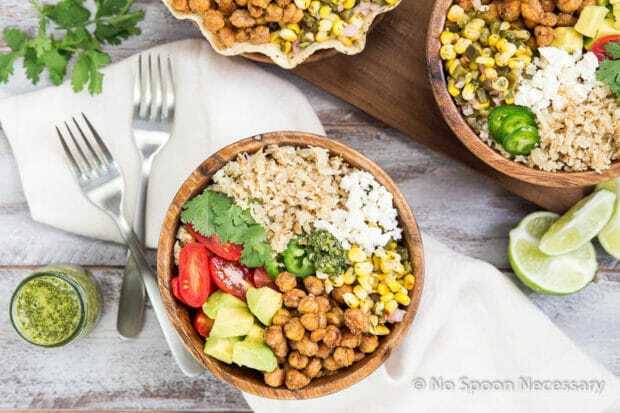 But, these cauliflower and chickpea burrito bowls aren’t just healthy and scrumptious, they are also pretty dang quick to put together. 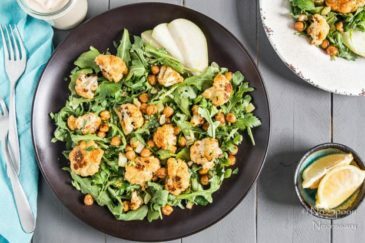 Season some chickpeas, blitz some cauliflower in a food processor, and throw them in the oven. While those are roasting, dice and slice some veggies, and whiz together the dressing. 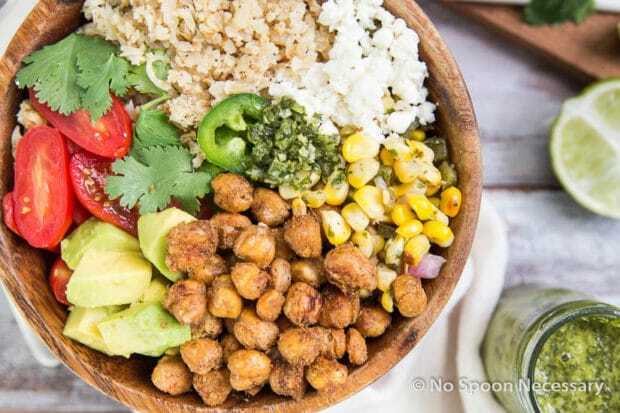 Badda-bing, badda-boom a Tex-Mex party in a bowl is yours for the devouring. Yay to that! 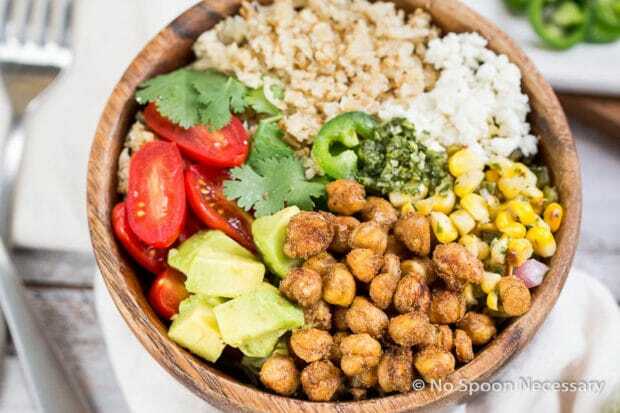 I know you are going to love these burrito bowls as much as I do. Because what’s not to love? Healthy, easy-peasy and outrageously delicious. Cheers! 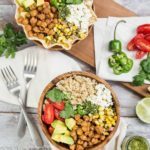 Roasted Chickpea & Cauliflower Rice Burrito Bowls. 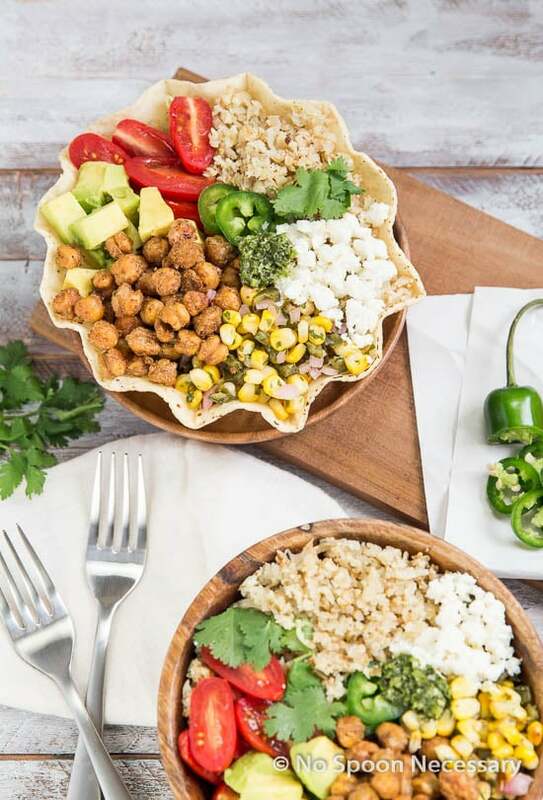 These bowls are a healthy and delicious upgrade on traditional Burrito Bowls! For the Cilantro Lime Vinaigrette: Place all ingredients, except olive oil, into the bowl of a food processor. Pulse to roughly chop ingredients. With processor running, slowly add the olive oil and puree until smooth and thoroughly combined. Add more olive oil, one tablespoon at a time, for a thinner vinaigrette. Transfer to a small bowl and set aside in the refrigerator for flavors to develop until ready to use. Preheat oven to 400 degrees F. Line two rimmed baking sheet with aluminum foil. For the Roasted Chickpeas: Place one lined sheet pan into the oven for 5 minutes to get hot. Meanwhile, in a medium sized mixing bowl combine the olive oil and dry seasoning. Add the rinsed and dried chickpeas. Toss to combine. Transfer to hot, lined baking sheet in an even, single layer. Roast for 15 minutes. Remove from oven and toss/stir. Place back into oven and continue to roast until brown and crispy, an additional 15-25 minutes. Remove from oven and allow to cool slightly on the pan for 5 minutes. Simultaneously, Roast the Cauliflower: In a large mixing bowl toss the shredded cauliflower with the onions, olive oil and dry seasoning. Spread out evenly on the prepared baking sheet. Bake for 15 minutes. Stir and add jalapeno rings to top. Continue to bake an additional 15 minutes, or until browned and roasted throughout. Remove from oven and allow to cool slightly. 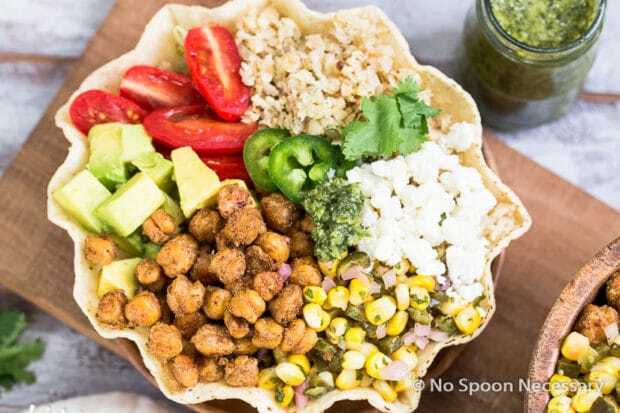 To assemble Burrito Bowls: Place shredded lettuce in a serving bowl or large tortilla shell, top with roasted cauliflower rice, roasted chickpeas, avocado, tomatoes, corn salsa and crumbled fresco. Garnish with cilantro. Drizzle with cilantro-lime vinaigrette. *To shred cauliflower: cut cauliflower into florets. In the bowl of a food processor, pulse cauliflower until they resemble small grains or use the shredding plate attachment. Alternatively you can grate florets on a box grater. *For Vinaigrette- Start with 6 tablespoons of olive oil, add more, one tablespoon at a time, for a thinner vinaigrette. Karrie, Thanks sweetness! So glad to hear I’m not the only person in the world that finds the local news depressing! I. just. Can’t! 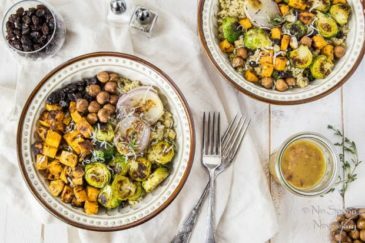 😉 And these bowls, not to pretty to eat… they are hard to stop eating! Cheers!